Just thought I’d share my Delta 36 725. New on site but the reviews on here are the reason I went with it. It was down to it and Rigid saw. Kept looking on CL with no luck either cheap saws or out of my budget. I read all the horror stories on both saws. Found this site and several good reviews and all tips on set up so I purchased it. Set up wasnt bad thanks to tips on here. Only real problem I have is finally got riving knife acceptable and just gave up. I need the saw to be mobil but wanted an out feed table so after making some inserts from ideas on here I started on the table. 2’x4’ melemine edged with 3/4 piece of plywood screwed and glued to underside. Couple of pieces of angle and some 1/4 bar stock. Bought some carriage bolts and drill out the existing holes and jam nutted with enough sticking out for notches on bar stock. Lift table lift bars and they slide forward. What are you thoughts on the saw, I am lamenting buying one here in the next week or so, soon as I get my truck running again. I am happy with the purchase. Would I love a unisaw or other high end cabinet saw, you bet. I doubt they would need the adjustments that are necessary on this saw. With that said, the info on here by others made setup a snap except the riving knife which is probably me. The only other problem I had was the left rail threw fence alignment off in relation to the miter slots. Little study and trial error with shims and problem solved. So I feel it’s a good saw and like others said I believe it’s a better saw than the rigid overall. I have include the shim fix in two pics. I have one and love it. The fence is very accurate and solid. The only thing I don’t like on this say is that with a shop vac, dust collection is miserable. It keeps the dust out of your face, but saw dust is everywhere inside and upderneath the saw. Think I’ll take the shroud off and fix a slanted box underneath with a repositioned dust port and see if that helps. Overall, if the blade is sharp, I haven’t had any problem with having a rock solid saw that you can still move out of the way in my shared garage. Ordering a zci and a dado insert for it helped a lot too. You already regret it, but you haven’t bought it yet? You already regret it, but you haven t bought it yet? Ok not quite the right word, Im waffling back and forth between buying one and going another route. There are several long threads and a great review on this saw. I have it myself and love it. Everything fits well, aligns well, just about everything can be adjusted for a perfectly tuned saw, and mobility is fantastic. Dust collection isn’t the best, but I have found it to be reasonable. There are several long threads and a great review on this saw. I have it myself and love it. Everything fits well, aligns well, just about everything can be adjusted for a perfectly tuned saw, and mobility is fantastic. Dust collection isn t the best, but I have found it to be reasonable. I’ve read them all over and over, footprint is my main concern as my Craftsman 113 has one of the wings removed from it and my garage is full of stuff. I wonder if just the right side fence tube can be used and brought inward to reduce the footprint. I purchased this saw two weeks ago based on the great reviews on this site. Unfortunately it seems that I had a lemon. The table top was warped, and had a pretty bad dip in the middle when I put a straight edge across diagonally from corner to corner. Almost enough to put a dime under the straight edge. How is your table top? 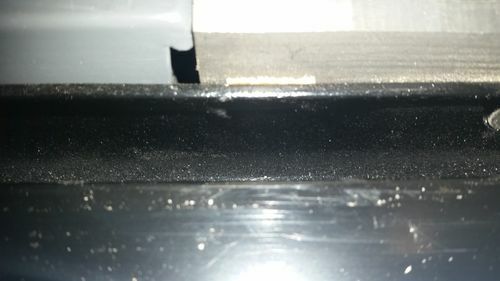 I talked to Delta customer service and they said that was a very unusual problem and a replacement saw wouldn’t have the same issue, but the lowes near me are all out of stock so I haven’t been able to buy one to replace it yet. I ve read them all over and over, footprint is my main concern as my Craftsman 113 has one of the wings removed from it and my garage is full of stuff. The fence could be moved I suspect, but it would require drilling some holes and it would just stick out on the left side. If you wanted to shorten it, I guess you could cut, but then that would eat into your maximum cut width. I roll my over on the side of my garage where the right side wing extends over other stored items. Works out good for me. I purchased this saw two weeks ago based on the great reviews on this site. Unfortunately it seems that I had a lemon. The table top was warped, and had a pretty bad dip in the middle when I put a straight edge across diagonally from corner to corner. Almost enough to put a dime under the straight edge. How is your table top? 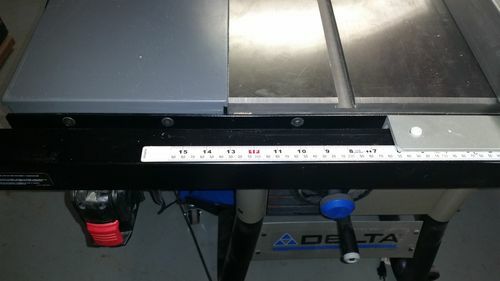 I talked to Delta customer service and they said that was a very unusual problem and a replacement saw wouldn t have the same issue, but the lowes near me are all out of stock so I haven t been able to buy one to replace it yet.